So I had to wandered away from keto for like two months. I didn’t know that I would ever go back to it because how I felt so restricted. However, I decided to give it ago after being on hiatus from my blog and trying to figure out balance in my eating after straying away, but we’ll get through that in another blog. After four weeks of simple keto, I’ve decided to spice things up and dive into some recipes. 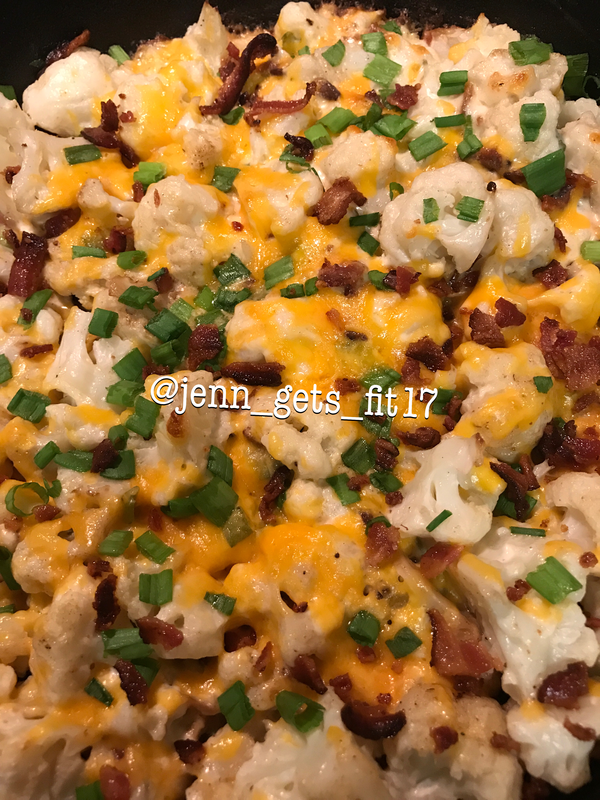 Here is the recipe to this amazing loaded cauliflower. 2. Bring pot of water to boil and boil cauliflower until mildly tender 8-12 minutes. 3. In a bowl: combine 1/2 of cheese, half of green onions, sour cream, mayonnaise, half of bacon. 4. I prefer the cast iron skillet (everything just cooks better, but you can use regular baking dish. 5. Coat skillet or baking dish with bacon grease. Place cauliflower and mixture of contents in. Mix well and place in oven for 12 minutes or until cheese is melted. 6. For the last minute sprinkle the last bit of green onions and cheese. 7. Place last pieces of bacon on top when you’re ready to serve. I am pairing this dish with plain oven fried wings!!! Next Post What happened in Iowa!!! What were your carb and macro limits per day? Thanks for the question. My current macros are P 90 F 117 C 20.